The Agency Domain meta-model includes the elements (Figure 1) that are used to define an agent-oriented solution for the problem depicted in the previous stage. Being our approach an organization one, the solution will be mainly composed of the definition of the necessary social structures designed in a multi-perspective way. Static behavioral views will be considered as well as an ontological description of concepts, predicates and actions involved in the solution and the definition of the interactions occurring among roles. In this subsection we will discuss the most important elements of this domain. Table 1 presents the major concepts defined in the Agency Domain meta-model. Communication An interaction between two or more roles where the content (language, ontology, and encoding) and the control of the communication (protocol) are explicitly detailed. A communication is composed of messages expressing communicative acts. In a communication, participants are Agent Roles and the knowledge exchanged between them is explicitly represented by a set of ontology elements. A Protocol defines a sequence of expected message communicative acts and represents a common pattern of communication, a high-level strategy that governs the exchange of information between Agent Roles. Group An instance in the Agency Domain of an Organization defined in the Problem Domain. It is used to model an aggregation of Agent Roles played by holons. Agent Role An instance of the Problem Domain Role. It is a behavior (expressed by a set of Agent Tasks) and it owns a set of rights and obligations in a specific group context. Agent Roles interact by using communications within the context of the group they belong to. Several Agent Roles are usually aggregated in the Autonomous Entity that plays them. An Agent Role may be responsible for providing one of more services to the remaining part of the society. Holonic Group A group that is devoted to contain holonic roles and takes care of the holon internal decision-making process (composed-holon’s government). Holonic roles are used to represent in an organizational way the notion of moderated group. They describe the level of authority of a member inside the holon members community and the degree of commitment of a member to its super-holon. Agent Task An Agent Task is a refinement of a Problem Domain Role Task. It is a portion of a role behavior and it may be composed by other Agent Tasks or atomic Agent Actions. It may contribute to provide (a portion of) an Agent Role’s service. Agent Action The atomic composing unit of a behavior. An action takes a set of inputs and converts them into a set of outputs, though either or both sets may be empty. An example of the most basic Agent Action consists in invoking a capacity or a service requiring the same inputs. Autonomous Entity An abstract rational entity that adopts a decision in order to obtain the satisfaction of one or more of its own goals. An autonomous entity may play a set of Agent Roles within various groups. These roles interact each other in the specific context provided by the entity itself. The entity context is given by the knowledge, the capacities owned by the entity itself. Roles share this context by the simple fact of being part of the same entity. Agent An autonomous entity that has specific individual goals and the intrinsic ability to realize some capacities. Goal A description of an objective to pursue and represents an abstraction of a projected state of affairs to obtain. Individual Goal A goal pursued by an individual agent that may be related to its personal desires or intentions. This agent will deliberate to determine a plan or a strategy to achieve its individual goals. Collective Goal A goal pursued by a community of individuals which has the commitment of (a part of) the community members. Service It provides the result of the execution of a capacity thus accomplishing a set of functionalities on behalf of its owner: a role, a group, an agent or a holon. These functionalities can be effectively considered as the concrete implementation of various capacities. A role can thus publish some of its capacities and other members of the group can profit of them by means of a service exchange. Similarly a group, able to provide a collective capacity can share it with other groups by providing a service. A capacity is an internal aspect of an organization or an agent, while the service is designed to be shared between various organization or entities. To publish a capacity and thus allow other entities to benefit from it, a service is created. Resource The abstraction of an environmental entity. It may be manipulated by roles through specific capacities. Probably holon is the central element of the ASPECS methodology in introducing it we may have some advantage from a quick historical perspective on the origin of the term. The term Holon was coined from the Greek ’holos’ meaning ’whole’, and the suffix ’on’ meaning ’part’ or entity (for instance as a proton or neutron is a part of an atom); hence a holon is a whole to those parts beneath it in the hierarchy but at the same time a part to those wholes above it . A holon is a self-similar structure composed of holons as sub-structures. This hierarchical structure is called a holarchy. A holon may be seen, depending on the level of observation, either as an autonomous ’atomic’ entity or as a group of interacting holons. Each holon is an autonomous entity that has collective goals (shared by all members) and may be composed by other holons, called members or sub-holons. A composed holon is called super-holon. A super-holon is not only characterized by its members but also by their interaction patterns. This implies that two super-holons may be created from the same set of sub-holons if the way their members interact differ. 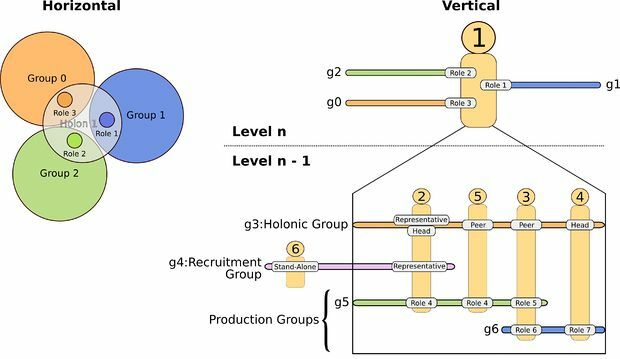 A super-holon contains at least one single holonic group to define how members get organized and govern the super-holon, and a set of production groups (at least one) to describe how members interact and coordinate their actions to fulfill the super-holon objectives. An example of a super-holon typical structure is reported in Figure 2.
it is the externally visible part of a super-holon, it is an interface between the outside world (same level or upper level) and the other holon members. It may represent other members in taking decisions or accomplishing tasks (i.e. recruiting members, translating information, etc). The Representative role can be played by more than one member at the same time. it represents a privileged status conferring a certain level of authority in taking decisions inside the holon. Normally in charge of doing tasks assigned by Heads, a Peer can also have an administrative duty, and it may be employed in the decision making process. It depends on the configuration chosen for modelling the super-holon. This role represents a particular status inside a holonic system. In contrast to the previous holonic roles, it represents the way a member sees a non-member holon. Stand-Alone holons may interact with the Representatives to request their admission as new members of an existing super-holon. The three first holonic roles describe the status of a member within a super-holon and participate in defining the holonic organization. Each of these roles can be played by one or more members, knowing that any super-holon must have at least one Representative and one Head. The roles Head, Peer are exclusive between them, while Representative may be played simultaneously with one of the two others. Each of these member holonic roles is parameterized using a specific status that specifies if the corresponding holon member is shared between various super-holons. The Part status represents members belonging to only one super-holon while the Multi-Part status represents sub-holons belonging to more than one super-holon. Figure 3 describes the structure of two super-holons sharing one of their members. At the finest grained level of abstraction (that also means the first level of composition), holons are composed by groups and their associated roles played by agents. From a motivational point of view agents and holons are different: an agent has Individual Goals that means it is self-interested in reaching some goals. If the accomplishment of these goals prescribes or encourages the association to a holon (a community then the agent will try to join it and play one of the roles defined within it. On the other hand, a holon is motivated by Collective Goals that corresponds to a set of goals commonly shared among its members. A holon acts in the interest of the community of members that it embodies at an upper abstraction level. C. Gerber, J. Siekmann, and G. Vierke. Technical Report DFKI-RR-99-03, DFKI - GmbH, 1999.